How To Make $300/hr Doing What You Love. We stood there for half an hour, bopping to the music and watched at least 30 people put $10 into their guitar case and pick up a CD. My fiancee decided that she also wanted to buy a CD, but we didn’t have any cash on us, so she “Liked” them on Facebook to stay in touch. She was about a 1200th “Like” they had yesterday. Today they had more than 2000. You could look at it as a financial success story, but I think it goes much deeper than that. 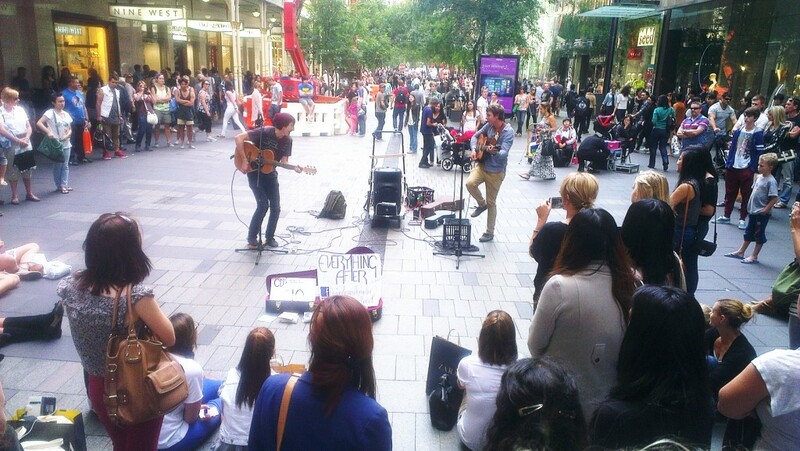 Busking is not a new thing; artists have been doing it for decades. But what isnew is an ability for artists to capture attention of an inspired, smartphone-wielding, social-media-savvy crowd make a direct, ongoing connection with them. And then have that crowd spread their art and ideas, exponentially, to other people. These kids didn’t just sell a few thousand dollars worth of CDs yesterday. (And, by the way, I think it’s awesome that they have an income which allows them to focus on their art instead of flipping burgers at McDonalds to make a living). They set up direct communication channels with a few thousand people. And that is worth much more than the money they made. What’s also crucial is the direction in which these relationships were formed: the initiative to make a connection came from the crowd to the artists, not the other way around. These boys didn’t have to “do marketing”, door-knocking, spamming or pitching. The crowd reached out and said “I like you – you can send me communication and I’ll also check in on how you’re doing”. In the past, artists who wanted exposure, communication with crowds and ability to market themselves had to hunt for, and rely on, agents and record labels. Fatcat producers often made a killing just from having the right connections while artists did the real work – and often didn’t get paid as much for their talent. Do these kids need an agent? Well, perhaps they do – but if their aim is to make a reasonable living while doing what they love, they can do without one, as well. An agent is no longer a necessity, but a choice. And that is a possibility that is only starting to emerge as a real alternative to today’s artists – and is driven by the growth and acceptance of social media. Many freelancers and artists today are worrying about their ability to make a living. I think it’s the producers and agents who should be worried. The world is changing to give power back to the creators of art and eliminate the middlemen. More specifically, the power is coming back to artists who produce art that moves people and who are savvy about the digital online marketplace. This is a guest post by Steven McConnell. He is a professional family photographer from I Love My Family Photography and he is based in Sydney, Australia.